Learners today experience a broad landscape of physical settings enabled by unprecedented mobility, as well as by proliferating virtual places to interact. They seek out blended activities bringing together social experiences, new insights and knowledge sharing. Institutions need to maximize use of their space resources and to enhance the on-campus experience. To understand this new landscape, we help you explore the impact of key trends and develop campus level strategies. Analysis of trends in pedagogy and emerging user needs provide insights and implications for campus-wide planning and facility programming. "Planning the Informal Learning Landscape" with Phillip Long, ELI webinar 2007 and SCUP Campus of the Future conference presentation, 2006. A comprehensive planning framework for integrated planning of initiatives to stimulate innovation. The Innovation Landscape Framework is a tool to help coordinate physical planning with organizational initiatives, engage a wide range of stakeholders, and foster a more widespread culture of innovation. It views the campus as an Innovation Landscape, in which many types of innovation are encouraged and settings for collaborative creative activity—both physical and virtual—infuse the campus fabric and are part of the daily experience of its users. "Crafting the Innovation Landscape", Planning for Higher Education, journal of the Society for College and University Planning, feature article in winter issue on innovation, March 2017. 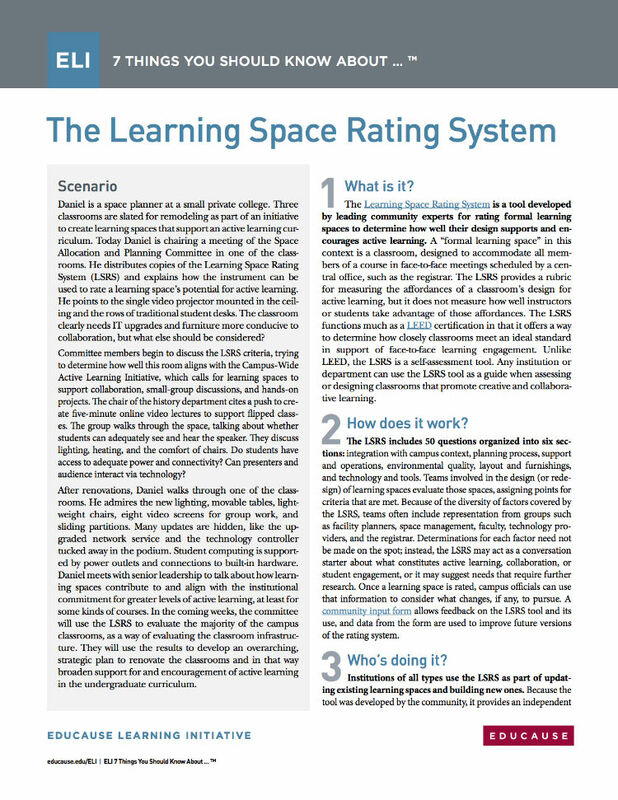 A rating system developed to measure the potential performance of learning space to support active learning and engagement. Shirley Dugdale has been a co-developer of the LSRS since 2010 with the EDUCAUSE Learning Initiative. The system is designed to rate teaching spaces and measure progress toward planning more effective learning space across campuses. It provides the higher education community with a common language and method to document best practices. Version 2 was released in Feb. 2017, incorporating community feedback.